There is a certain point in February when the snowdrop tidal wave starts to curl. Every year I try valiantly to surf this wave: studying, photographing, imbibing, drowning; and every year I am left spluttering and gasping in its white, foamy wake, literally overwhelmed. 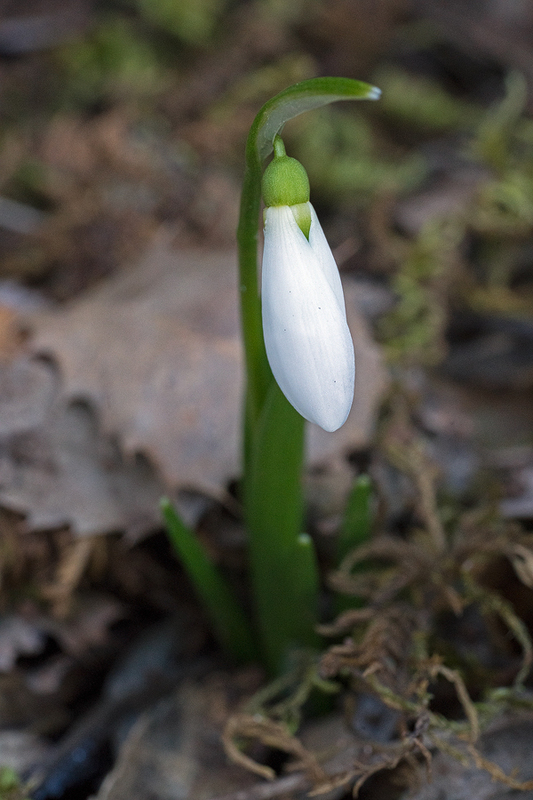 This year I have set myself the goal of trying to see every snowdrop species in flower in a single season. ‘So far, so good,’ as the man falling from a ten storey building said, when he whistled past the second floor. Galanthus fosteri is that rarity among snowdrop species, an uncontroversial, easily recognised taxon, with no synonyms*. It occurs at sub-alpine elevations in a band running north-south through central Turkey and on down into Syria and northern Lebanon. While I am prepared to take risks for my – ahem – hobby, arguing the finer points of vernation with representatives of Hezbollah or the al-Nusra Front is not high on my list of things to do (moments) before I die. 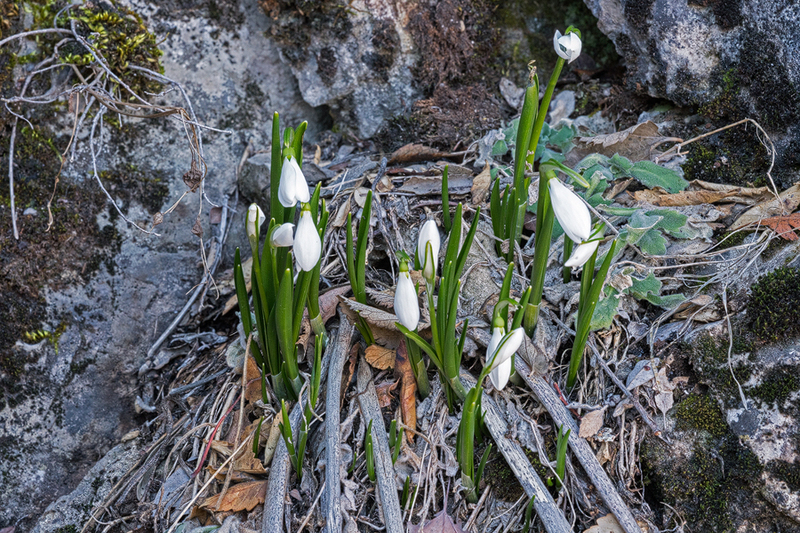 It was to southern Turkey that I headed, therefore, in the hope of finding snowdrops without having to worry about bread knives or Russian warplanes. 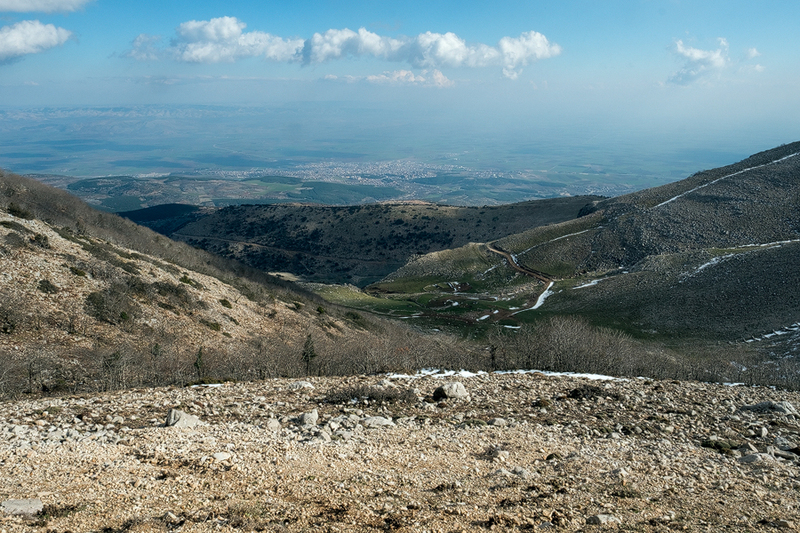 View from ridge east of Iskenderun towards Syria. Most of whatever success I’ve had in finding plants in the wild is due to the generosity of friends and correspondents who have been there, done that. That and a certain mule-like stubbornness on my part. It had been suggested that I search in the vicinity of Iskenderun, a coastal city close to the most southerly point in Turkey. That advice chimed with a dot on the distribution map in Aaron Davis’s monograph, so the only problem was to find a road that runs through suitable habitat, at approximately the right elevation. Roads, in my experience, are seldom constructed with the convenience of galanthophiles in mind. Deciduous oak forest, east of Iskenderun, about 1,200m. 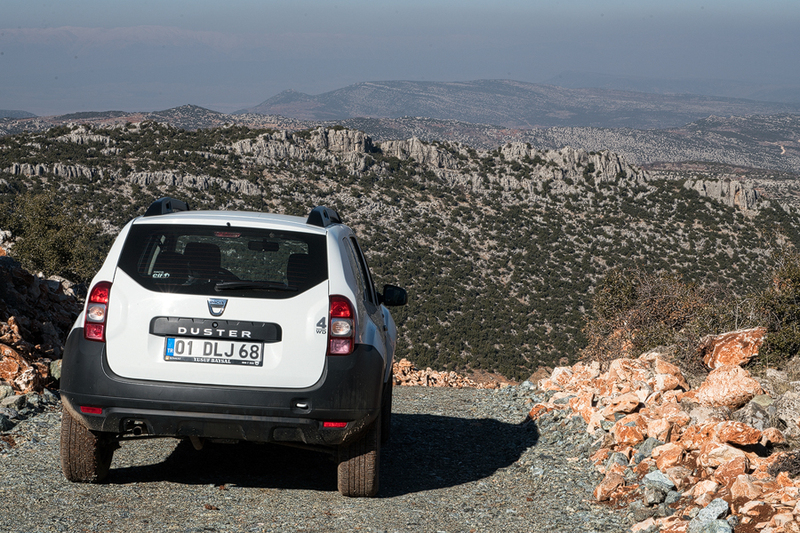 As it happens, there are a few such roads, most of them unmetalled, in this part of Turkey. And so I found myself passing through villages and the degraded, heavily grazed garrigue that surrounded them, up through coniferous forest and into a zone of low, scrubby, mainly deciduous, oak woodland, which started at an elevation of about 1000m. I stopped the car a little higher up and scrambled down the steep slope, into the woodland, for a look around. 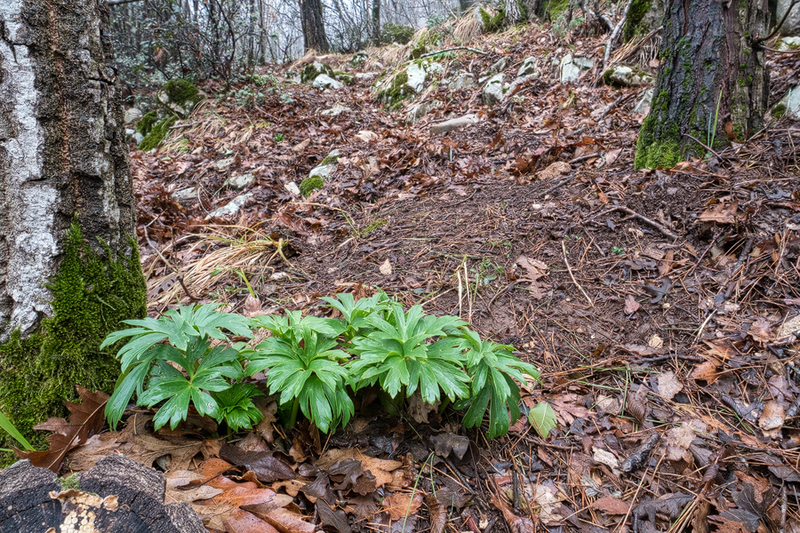 Helleborus vesicarius, a fascinating species, disjunct from the range of most members of its genus, was emerging through the leaf litter and, in a few cases, just starting to flower. 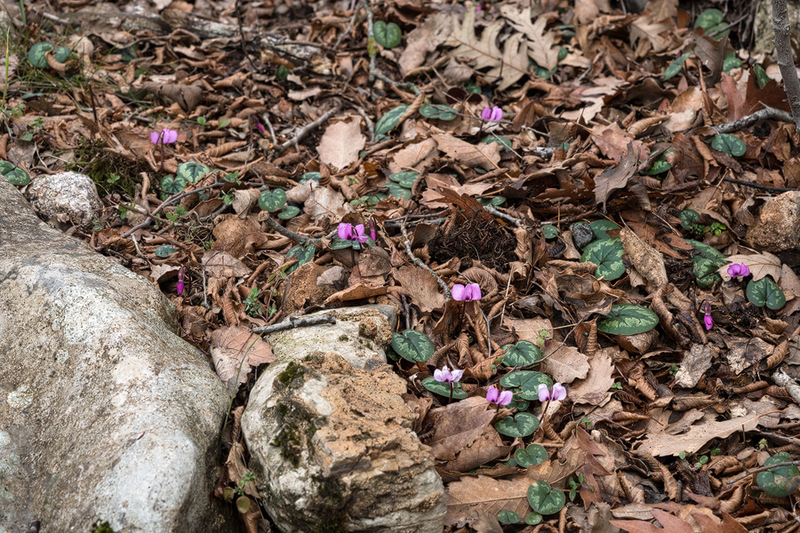 The leaves of Cyclamen pseudibericum dotted the ground and a few plants sported bright magenta flowers. 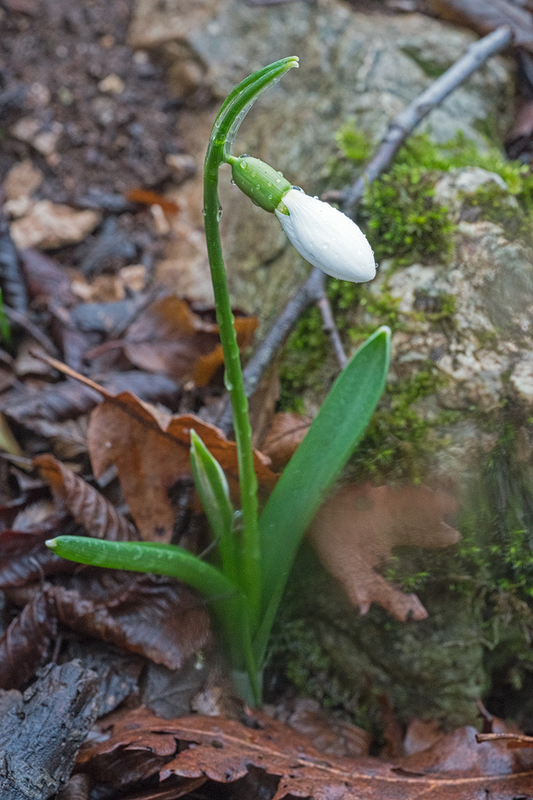 This was all very encouraging but there was no sign of snowdrops and I made my way back to the car, cutting across the slope, resigned to the long, laborious process of stopping and searching numerous times. 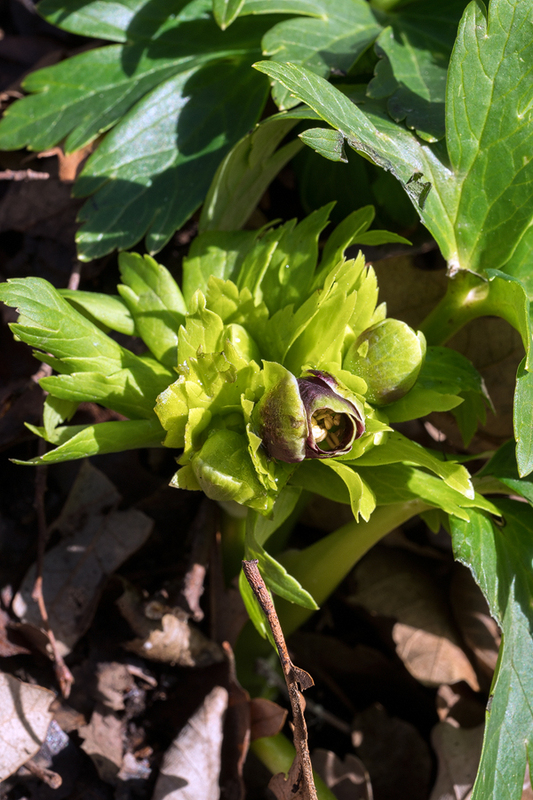 Helleborus vesicarius emerging, east of Iskenderun, 2/2/16. Helleborus vesicarius starting to flower, east of Iskenderun, 2/2/16. Cyclamen pseudibericum emerging, east of Iskenderun, 2/2/16. I love the moment of discovery. Perhaps it would not be an exaggeration to say that I live for it. One moment you’ve travelled thousands of miles and have nothing but a large carbon budget to show for it; the next instant, success! I had stumbled into what turned out to be a fairly small, dispersed population of G. fosteri, only just starting to flower. A sparse population of Galanthus fosteri, just starting to flower, east of Iskenderun, 2/2/16. 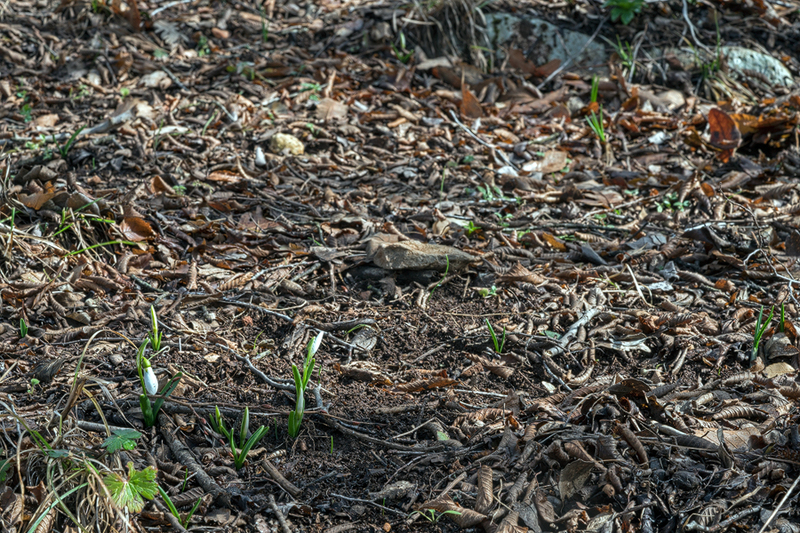 Open oak woodland habitat of Galanthus fosteri, east of Iskenderun, 2/2/16. None of the flowers were fully open yet, and many were still encased in their translucent spathes, but I was elated. 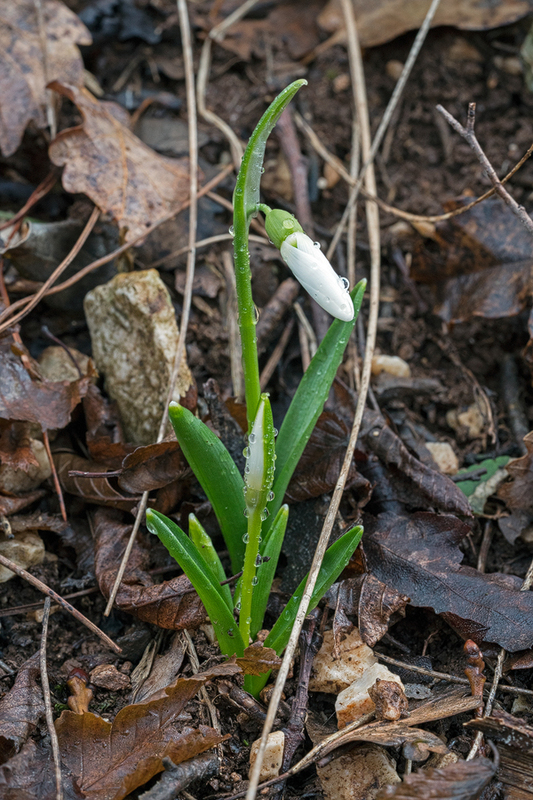 Galanthus fosteri, east of Iskenderun, 2/2/16. Some snowdrop populations are spectacular floral displays but it would have been easy to walk right through this one without noticing it. These plants were diminutive – most no more than 10cm tall – though they were of course in the early stages of emerging. The flowers were mostly tiny too, with outer segments ranging in length from one to two centimetres, in most cases nearer to the former than the latter. 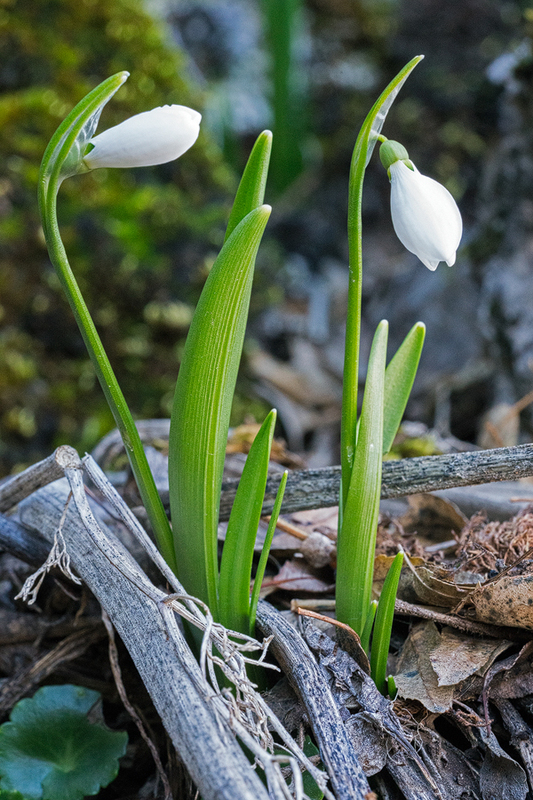 Most of the plants were single bulbs, showing no tendency to clump, as some snowdrop populations do. The colony was dispersed over about half a hectare, with plants occurring in diffuse clusters within that area, becoming much thinner towards its margins. Galanthus fosteri, east of Iskenderun, 2/2/16. Note bight green leaves and obviously supervolute vernation. The combination of bright green, shiny leaves, supervolute vernation and both apical and basal green marks on the inner segments make G. fosteri impossible to mistake for any other species. These features were all unambiguously present here. 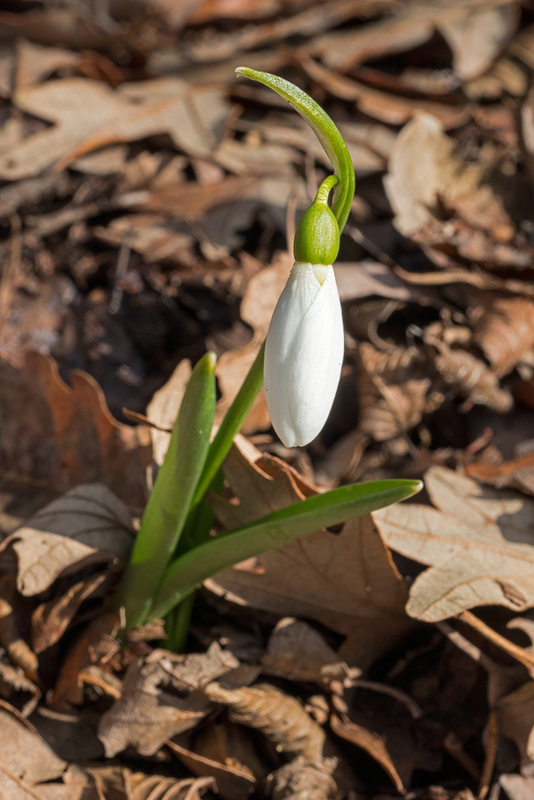 As with almost every wild snowdrop population, however, there was considerable variation in all characters. Galanthus fosteri, west of Gaziantep, 4/2/16. Note longitudinal grooves on lower surfaces of leaves. The leaves were all bright green on both surfaces, though a few appeared to have a slight glaucous bloom on the adaxial surface. The abaxial surface was slightly longitudinally grooved, in the manner of G. koenenianus, though the grooves were not as pronounced as they are in the latter species. The vernation was unambiguously supervolute in all cases that I saw. The leaves varied in width from 5mm to 15mm and were generally curled up, like the hull of an open canoe. 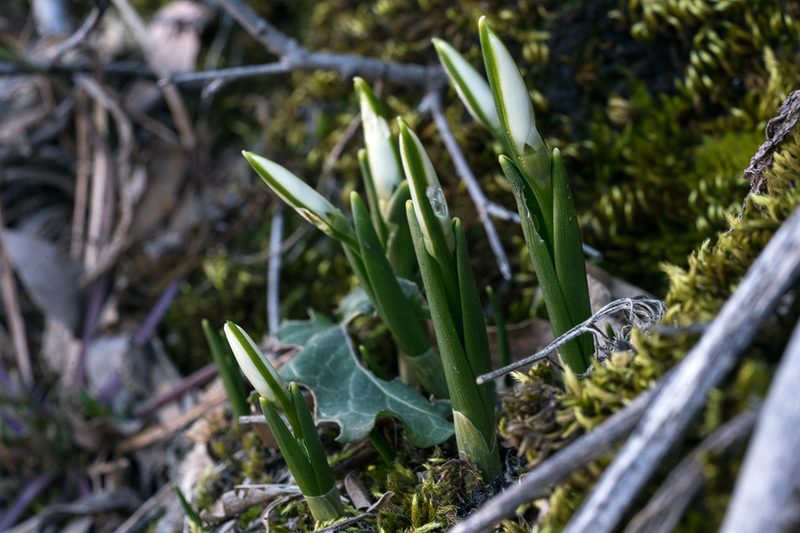 The leaves and flowers were emerging simultaneously. A relatively broad-leaved variant of Galanthus fosteri, east of Iskenderun, 2/2/16. Upper leaf surface slightly glaucous. Because the flowers were not yet open, it was difficult and time-consuming to get an impression of the variation in inner segment markings. All the flowers that I examined had both basal and apical marks of a delicious, dark, emerald green colour. The basal mark often started about 1mm from the base of the segment, leaving a narrow, white band adjacent to the receptacle. The basal mark varied substantially in size, covering between a quarter of the inner segment and more than half. The apical mark was typically an inverted V-shape and generally narrow, often no more than a thin, green line, but sometimes thicker. Unfortunately I could not photograph this variation! Hard though I looked, I didn’t see any plants with unusual markings on the outer segments. A robust plant of Galanthus fosteri, with two scapes. East of Iskenderun, 2/2/16. A small proportion of the plants in this population had two scapes per bulb. One other observation: the flowers seemed to be an incredibly pure white; the distillation of whiteness. Perhaps it was my imagination. Bright white flowers. Galanthus fosteri, west of Gaziantep, 4/2/16. The woodland in which the snowdrops grew was west-facing. As the day wore on, the sun occasionally broke through thin cloud and quite a bit of light and warmth penetrated through the canopy of deciduous trees to the ground. The rocks were limestone and the soil a rather sticky, clay-rich, reddish loam. 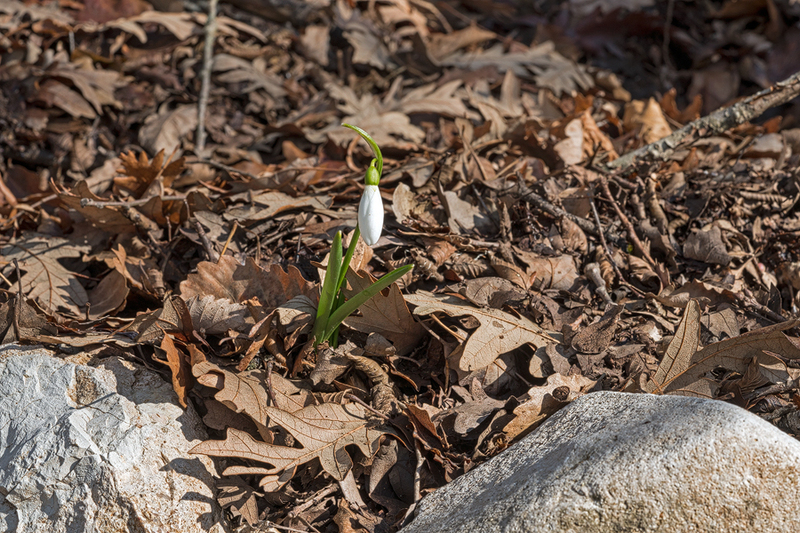 Galanthus fosteri growing among limestone boulders, east of Iskenderun, 2/2/16. Eventually I decided to move on, to search higher up the mountain and it was while I was exploring at about 1300m that the shooting started. I am deaf in one ear and so have no directional sense of hearing. Unless there are visual cues, I cannot tell where a sound is coming from. 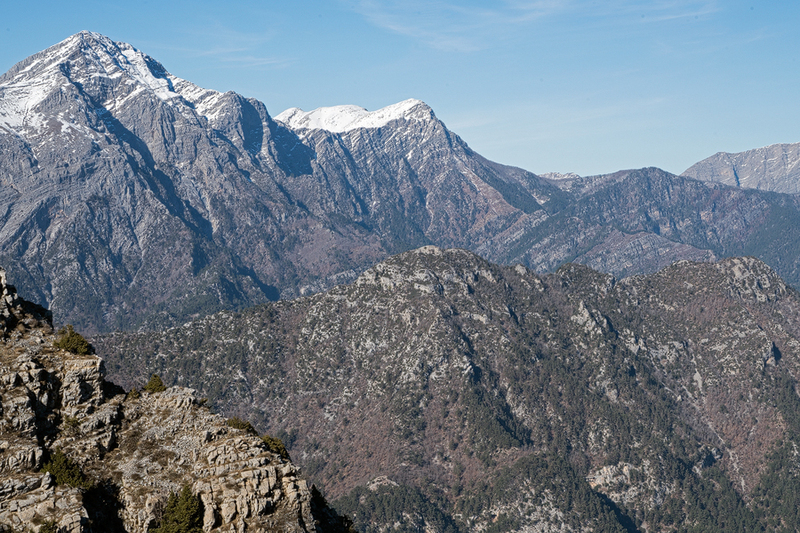 I reasoned that, because I could still hear the reports echoing from the mountains, it was unlikely that I’d been shot. I didn’t, however, hang about to allow whomever was shooting to refine his aim for, these days, I make a very large target. Driving back down the road, I soon passed a group of boys firing rifles and revolvers at targets set up on the hillside where I’d been botanising. They waved cheerily, as I passed. The first introduction of G. fosteri into cultivation in western Europe was from a collection made on Dumanli Dağ, above Duziçi (formerly known as Haruniye). I had looked for snowdrops here once before, unsuccessfully, but decided to have another go. At the same elevation as the population near Iskenderun it was considerably colder; the soil was frozen solid and snow still lay on the ground, not much higher up the mountain. If there are snowdrops to be found there, I was either too early or looking in the wrong place. 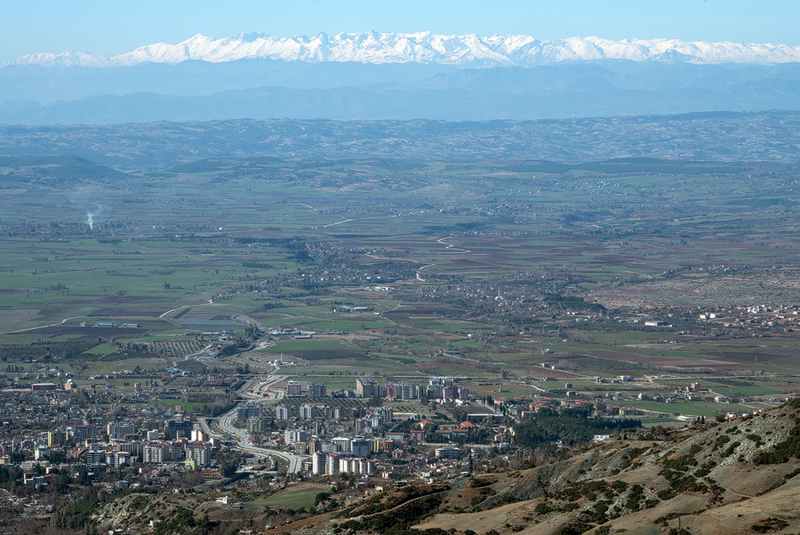 But the views of Dumanli Dağ were magnificent. That night I stayed in Gaziantep, east of Adana. This bustling city is the main staging point for the pathetic young men and women travelling to Syria to join Daesh’s lost cause and die there or flee, whining like whipped dogs, back to the lands they have betrayed. Hotels are prime targets for the psychopaths and so, in order to get through the doors, one must pass through ‘security’. I wandered into the lobby carrying my camera on a tripod. The guard waved his wand at it and, unsurprisingly, the wand emitted a loud bleep. He nodded me through. A porter dragged my bags through the metal detector, which howled. I had the distinct impression that, had I placed an AK47 in the little tray for coins, it would have elicited no more than an ironic shrug from the bloke in uniform. Botanising west of Gaziantep, Turkey. One of my favourite roads for botanising runs from Gaziantep to Bahçe, in a fertile valley between limestone ramparts. The limestone is brilliant white, beneath its lichen-coated exterior and is quarried to make porcelain. Entire hills have been eaten away by digging machines and turned into toilet bowls. I have travelled this road twice before, both times in late May, and have found many exciting plants growing in the maquis. The bizarre, inflated seed pods of Helleborus vesicarius are prominent at that time of year, as are the banana-like capsules of Iris sari. 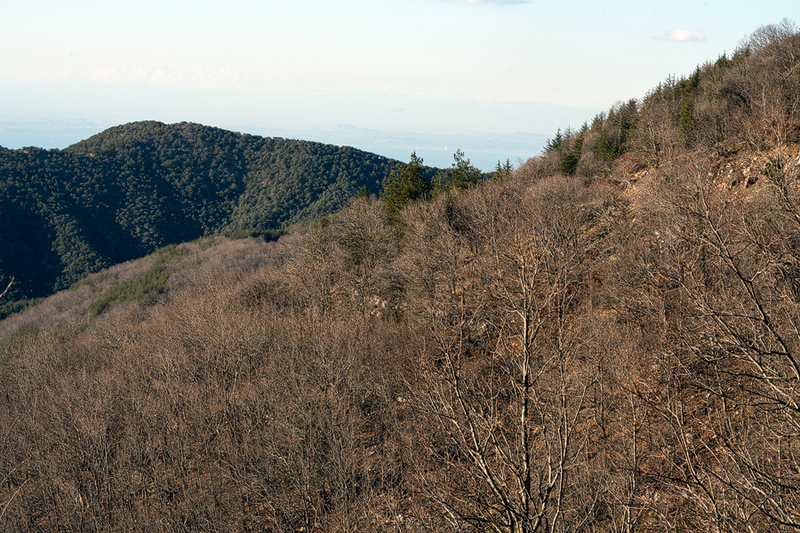 I had looked for, and failed to find, G. fosteri, which had been recorded here in 1994, by Zeybek. Studying images of the area on Google Earth, which is a great boon to plant hunters, I noticed a dirt road that had previously escaped my attention, which seemed to go high into the hills. North-facing crags, west of Gaziantep, Turkey. Habitat of Galanthus fosteri. 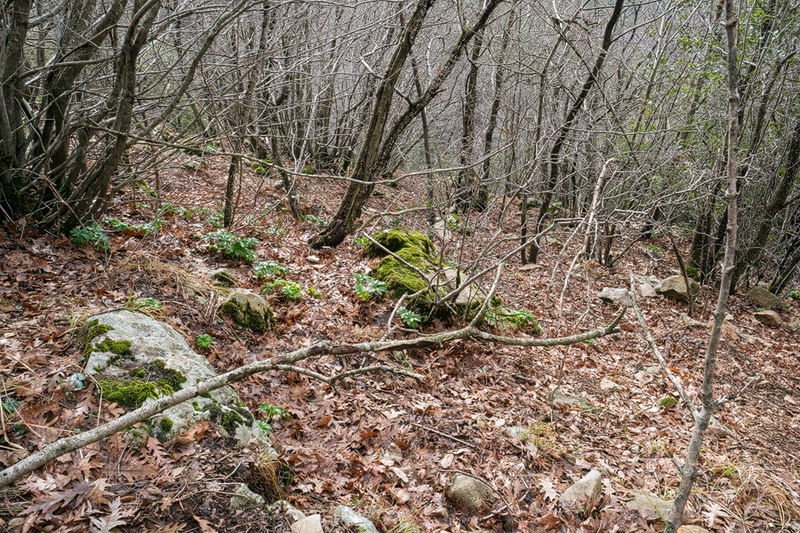 Soon I came upon a long north-facing cliff, at 1250m elevation, the slope beneath it cast into permanent deep shade at this season. The previous night had been bitterly cold and a heavy hoar frost lay on the ground. 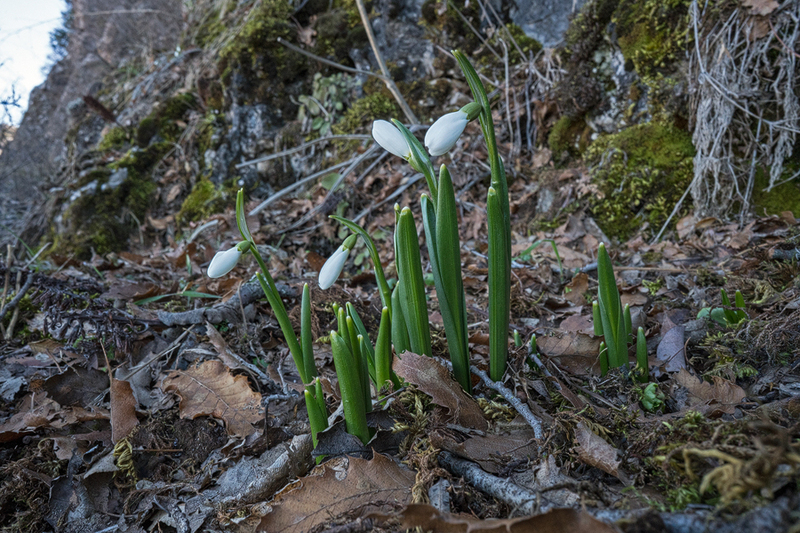 Trudging up the steep slope, I wasn’t very hopeful of finding snowdrops but, reaching the base of the limestone crags, I immediately saw that a large population was emerging, less advanced still than those near Iskenderun, but some beginning to flower. 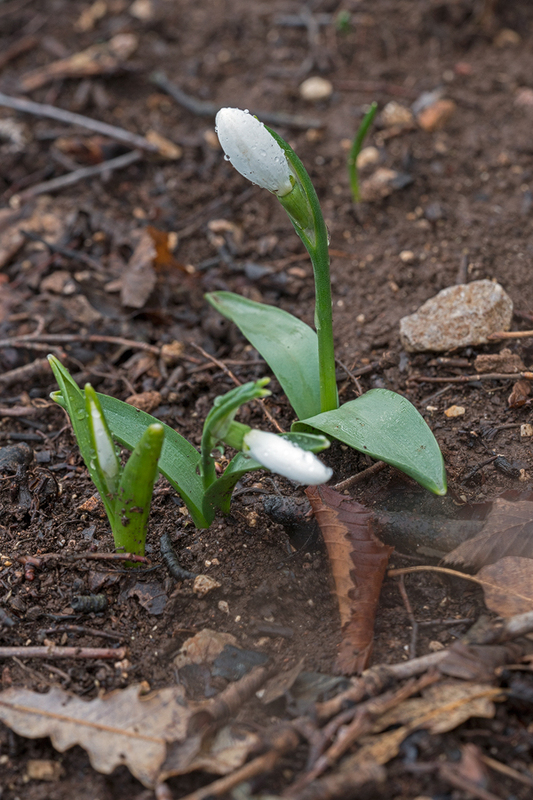 Galanthus fosteri just emerging, west of Gaziantep, 4/2/16. This habitat was quite different to the previous sites. 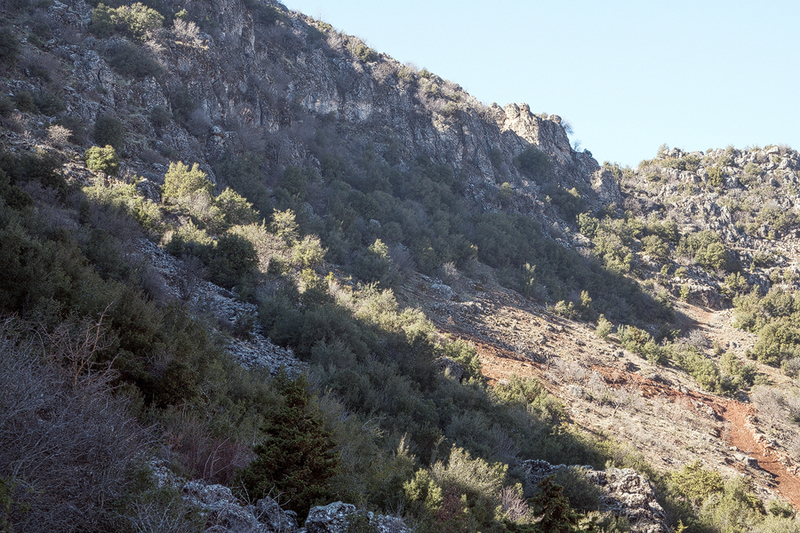 The slopes were littered with limestone rubble and the vegetation was low maquis, not much taller than me. There was a mixture of evergreen oaks and a diverse assemblage of deciduous shrubs, which I could not begin to identify without their leaves. 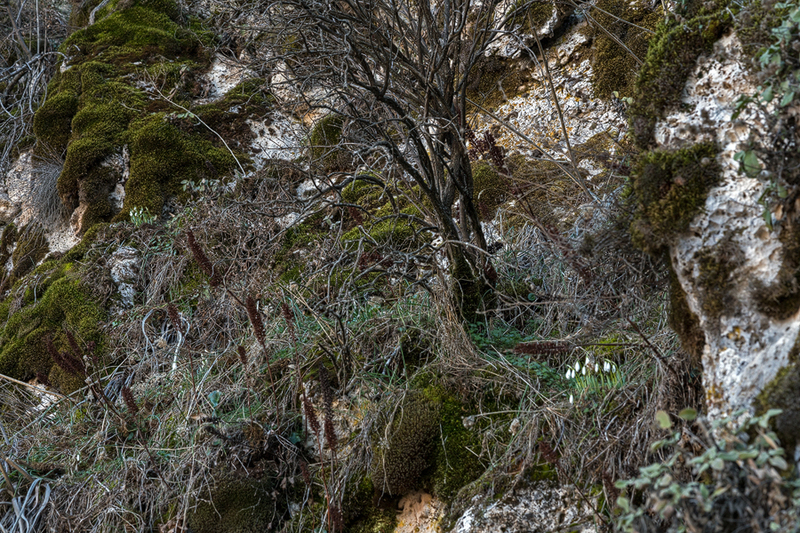 The snowdrops were growing exclusively on the crags and immediately beneath them and only on the east or north-east facing side of the rocks. They occurred in clusters, often running down long fissures in the rock. I was reminded of the habitat in which G. peshmenii grows on the island of Kastellorizo. Galanthus fosteri growing on limestone crags, west of Gaziantep, 4/2/16. Unlike the plants near Iskenderun, many of these had formed sizeable clumps of a single clone and numerous seedlings were also germinating among the clumps. galanthus fosteri often formed clumps of a single clone, in this population, west of Gaziantep, 4/2/16. 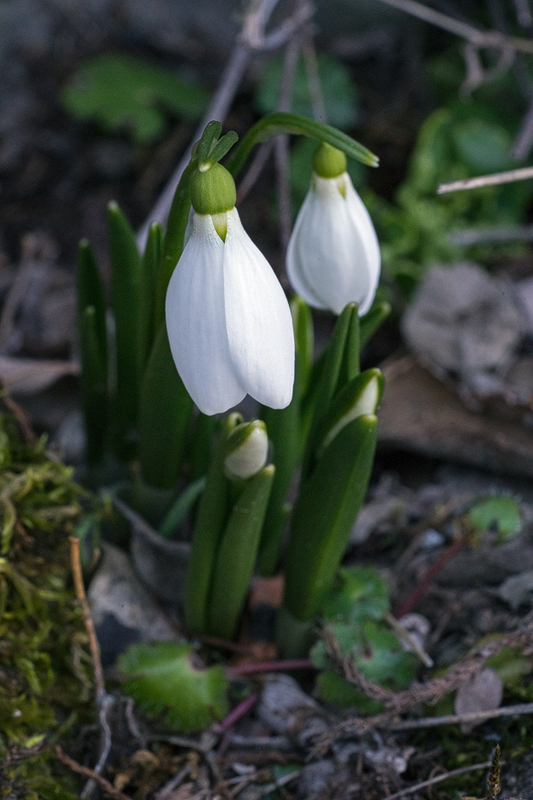 The snowdrops here were considerably larger, on average, than those at Iskenderun, the largest being about 20cm tall, with flowers up to 25mm long. The leaves were also broader, again on average. Sadly, I was again too early to photograph open flowers but those I checked were similar to the ones I had seen two days earlier. Although I carefully examined a lot of plants, I didn’t notice any unusual markings on the outer segments, except that a few plants had slight green staining at the base of the segments. But this wasn’t very dramatic. 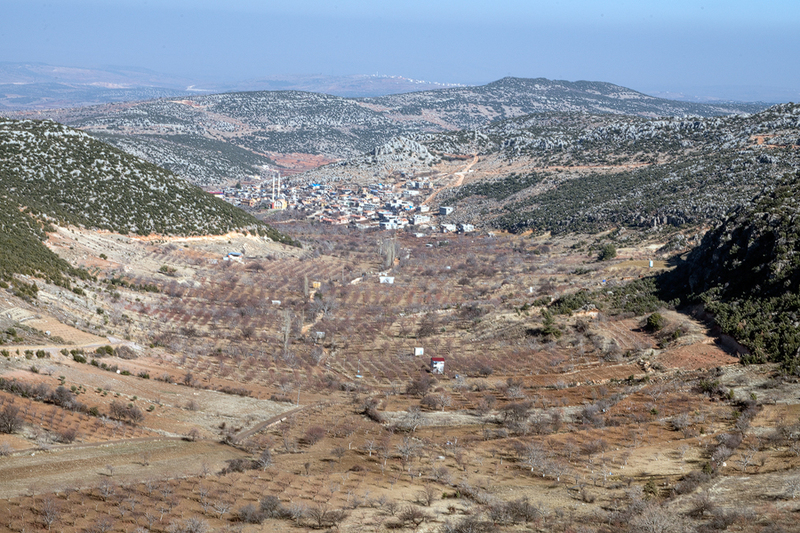 View looking away from the snowdrop population, over a broad, fertile valley, west of Gaziantep, 4/2/16. The view over the fertile, sunlit valley below was of orchards of fruit and nut trees, growing in neat rows, in the iron-rich, red, limey soil. 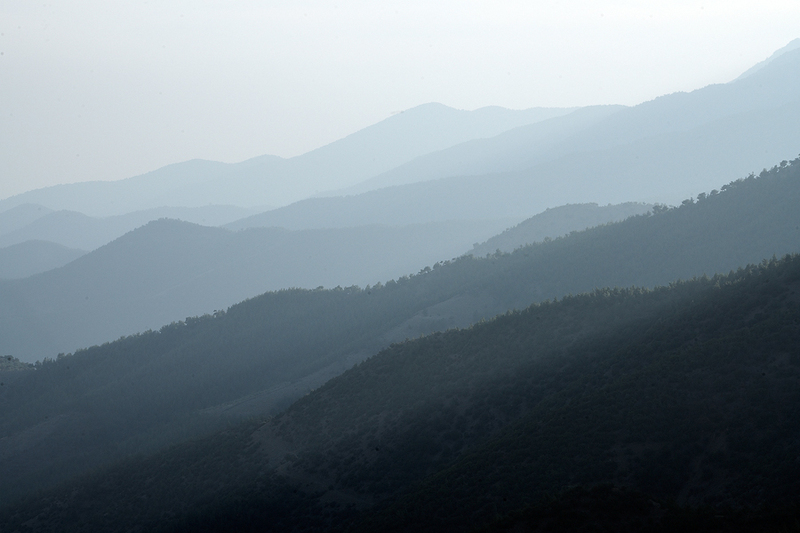 Mountains, northern Hatay province, Turkey, 4/2/16. There was just time, as the sun descended towards the horizon, to explore a wonderful road, winding up into the mountains in northern Hatay province. I suspect that, in late February, there are snowdrops to be found here too but I had to content myself with extraordinary views of this wild landscape. Northern Hatay Province, Turkey, 4/2/16. 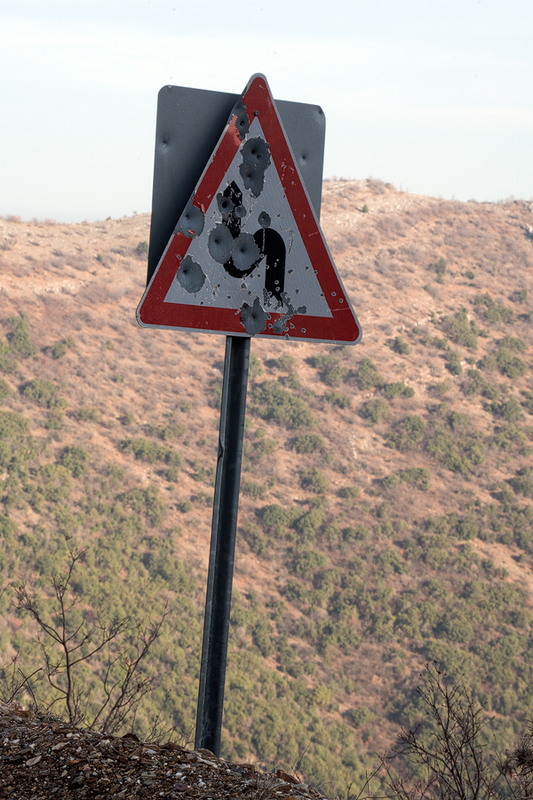 Half way up the mountain, I came across a sign that seemed like a metaphor for my path through life. Crooked and scarred but still, for now, creeping on. It is easy to be flippant about the extremely modest dangers I voluntarily face in pursuit of snowdrops. In truth, I have never felt anything other than completely safe, wherever I’ve travelled in Turkey: much safer than I do in central London. Galanthus fosteri, west of Gaziantep, 4/2/16. * The populations of G. fosteri that occur in the southern part of the range have been given varietal status, as G. fosteri var. antepensis. Until I’ve seen the northern populations, I can’t comment on whether this distinction is merited but the two studies that have investigated the variation in G. fosteri did find some minute differences**. One of these studies is published in the fantastically high profile journal Botanica Lithuanica and I haven’t been able to get hold of it. ** Kandemir, N. (2010) A karyological investigation on the two varieties of Galanthus fosteri Baker (Amaryllidaceae). Biological Diversity and Conservation 3/2: 20-25. Kandemir, N. & Öznur, A (2006) A comparative study on the morphological and anatomical properties of Galanthus fosteri (Amaryllidaceae) varieties in Turkey. Botanica Lithuanica: 12(3): 157-167.